I purchased my first Australian Shepherd in 1984. I enjoy showing my Aussies in confirmation competition. My daughter started showing Aussies when she was ten years old. A sport we now enjoy together. 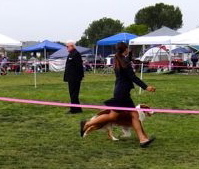 To the right, my daughter is pictured in perfect step with her dog. We do breed occasionally as we are a hobby breeder. If you are searching for a puppy or adult Aussie, please feel free to contact me directly.